AC Milan manager Gennaro Gattuso. 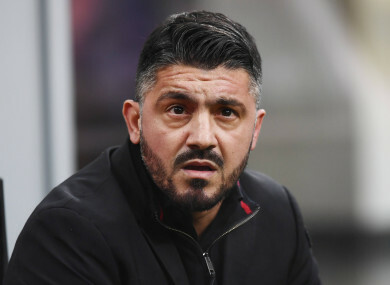 AC MILAN SHOULD accept they are not football’s answer to Brad Pitt and embrace their “ugly” style, according to manager Gennaro Gattuso. A run of three straight wins in Serie A has seen Gattuso’s men climb to seventh in the table, with a 0-0 draw in the Coppa Italia semi-final first leg against Lazio on Wednesday extending their unbeaten run to six games in all competitions. Milan have been grinding out results under the former Italy midfielder, who believes talk of a challenge for Champions League qualification is premature. “I know my ideas and the hard work of my staff,” Gattuso told reporters ahead of Sunday’s trip to Udinese. “I keep my feet on the ground and try not to read too much that is said about me, because I know there’s a long way to go. “We must not forget what people were saying about us only six weeks ago, otherwise we’ll regress. “We’re not Brad Pitt now, we’ve got to continue being as ugly as me and my beard, with dark circles under our eyes. “I hear talk of a Champions League place, but we’re not even in the Europa League spots now. “We are doing well because we are working well. The boys deserve it. We are a solid group, united. It’s important that everyone rows in the same direction because I need all my players, those who don’t get much playing time too. Sunday’s trip to Udinese sees Gattuso go up against Massimo Oddo, another member of Italy’s victorious squad at the 2006 World Cup. “I shared so much with Massimo Oddo,” Gattuso said. “He’s an intelligent and funny guy whose success speaks for him. “He got a few slaps in the face from me for his pranks, as we had very different ideas on how to prepare for a game. Email “'AC Milan aren't Brad Pitt, they're ugly like me' - Gattuso”. Feedback on “'AC Milan aren't Brad Pitt, they're ugly like me' - Gattuso”.